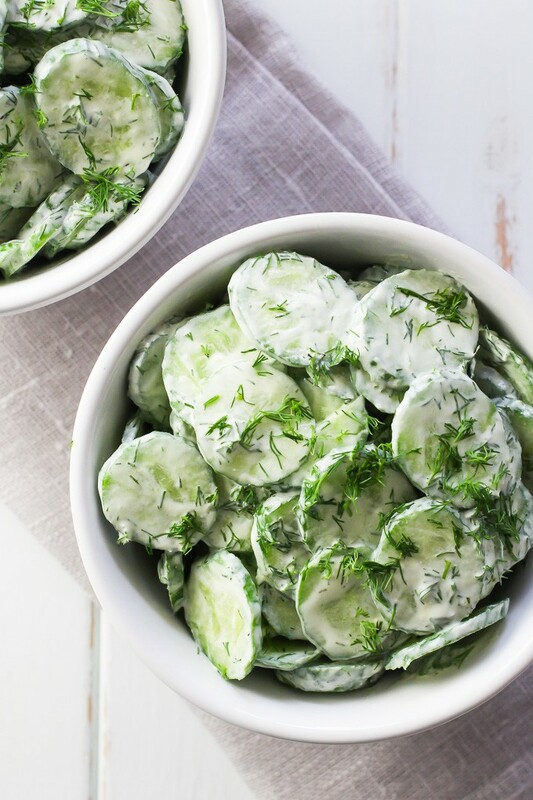 The traditional German cucumber salad is made with a lot of dill and you can also add parsley, tomatoes, and garlic. 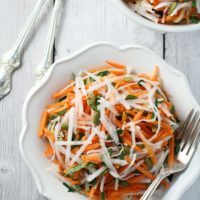 There are two types of dressing that are usually used for this salad. 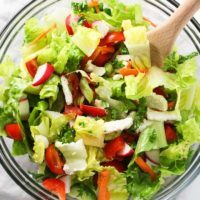 You can make it with a sour cream or yogurt based dressing or with an oil and vinegar based dressing. The secret to making a delicious German cucumber salad is to slice the cucumbers really thin. I wasn’t able to slice them super thin for the pictures because my mandolin slicer isn’t adjustable and I don’t really mind them to be a bit thicker. But Germans usually slice the cucumbers so thin that the slices are almost translucent. I prefer to buy small field cucumbers for this salad when they are available in grocery stores here in Toronto. I love them because they are local, super fresh, crunchy, and slightly sweet. But large field cucumbers or English cucumbers work great too. If you use large field cucumbers, make sure to peel them and remove the seeds. 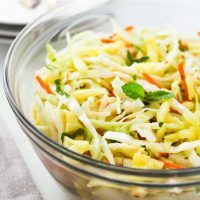 This cucumber salad tastes better when chilled so place it in the fridge for at least one hour before serving. And don’t be afraid to make a big batch as it keeps well in the fridge and even tastes better the next day as cucumbers ferment a bit. 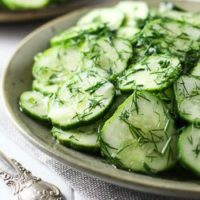 This cucumber salad also should be chilled before serving. 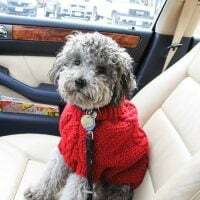 But keep in mind that it might become watery if it sits in the fridge for a long time so chill it for about 30 minutes and then mix it again before serving. 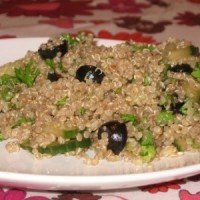 Although it will still taste fine the next day, you might not enjoy the watery dressing so it’s better to consume it the same day. And don’t forget to ask for the Gurkensalat if you go to a German restaurant. 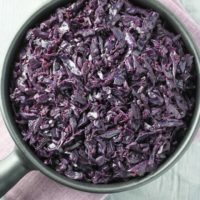 If you like simple salads made with raw vegetables, check out this Raw Turnip Salad, this Red and Green Cabbage Salad, and this Super Healthy Cabbage Salad. ***Please note*** The nutrition information provided below is for the cucumber salad with vinegar and oil. 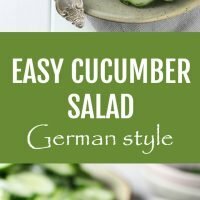 This simple German cucumber salad is crunchy and refreshing. 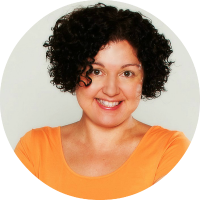 It’s perfect for a family dinner or a party and the leftovers taste great too. Two dressing options. 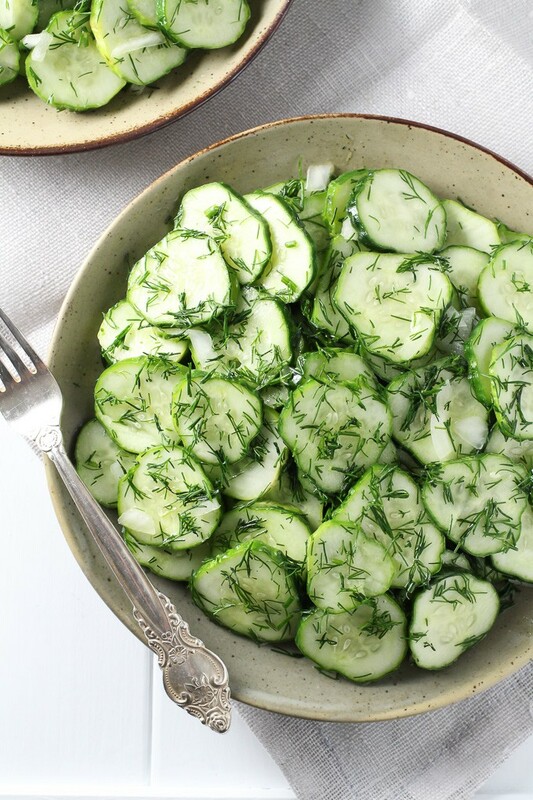 Place the cucumbers, onion, and dill into a large bowl. Add the white vinegar, olive oil, and sugar. Mix well to combine. Season with salt. Keeps well in the fridge for up to 24 hours. In a small bowl, add the sour cream, olive oil, mustard, white wine vinegar, sugar, and garlic (if using). Mix to combine. Add the dressing to the cucumbers and mix well. Season with salt. Refrigerate for 30 minutes before serving. Better to consume the same day. Nutrition information is a rough estimate for 1 of 4 servings calculated for the salad made with vinegar and oil. Thank you for providing two dressing options! Both were delicious. 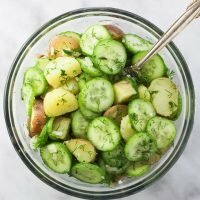 If you add salt to the cucumbers or in water should you rinse them before using or not add any more salt? I would just drain them and shake off the excess liquid. Then I would add other ingredients and taste the salad. If there is not enough salt, just add a pinch or so. Made both versions for a dinner party and everybody loved them! So easy to make and very inexpensive. Thank you for sharing the recipe! I salt my Cucumbers and let them sit for about 30 minutes, then i drain the juice before adding the Onions , Vinegar and oil, salting the Cucumbers takes away the bitter taste that you sometimes get by peeling and slicing the Cucumber from the wrong end, my Oma always said to peel from the Bloom to the Stem since the Stem part has a bitter substance in it, also salting the Cucumbers and discarding the juice makes them easier digestible. 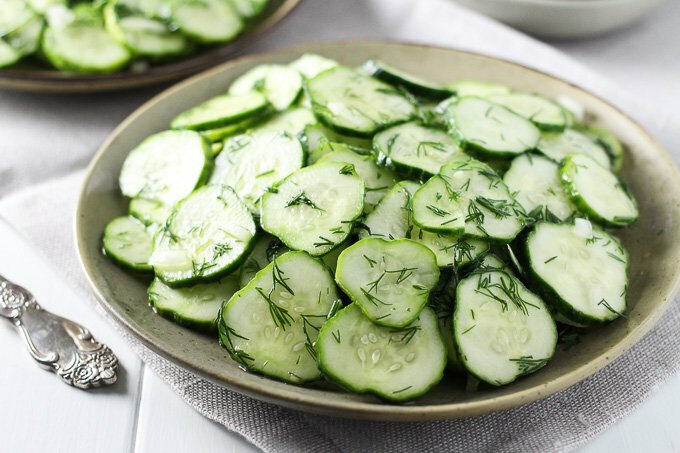 To stop from not being able to digest cucumbers. My German Dad told me a trick that works. 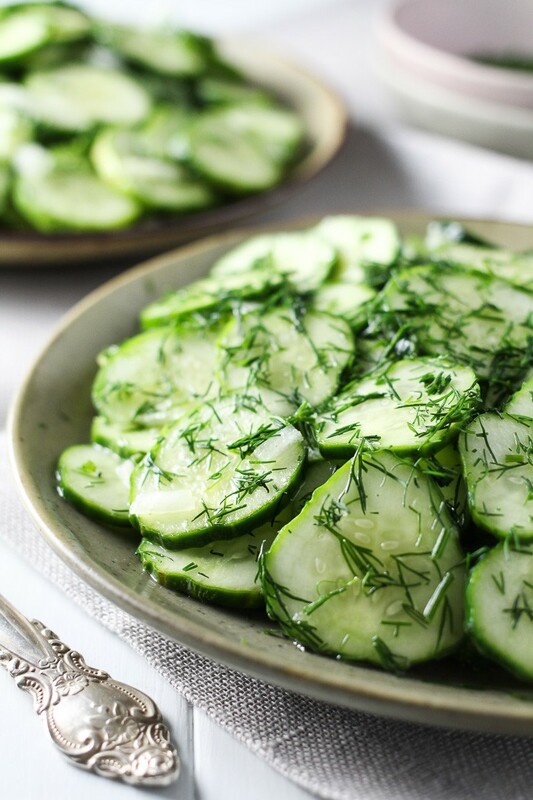 For cucumber salad, slice the cucumbers, put in a few tsp of salt to the water. Completely submerege the THIN cucumbers in the water. He did it several hours. So it takes longer to make, by soaking in the water. Continue with the GERMAN IDEA. You can soak cucumbers the same way, for other meals….Hope it helps others, like ME, who love cucumbers.